The Mercury in Leo people have excellent communication skills and have the ability to turn the situation in their favor. Leos pride themselves on their charm and wit and use these characteristics to make their point dramatically. 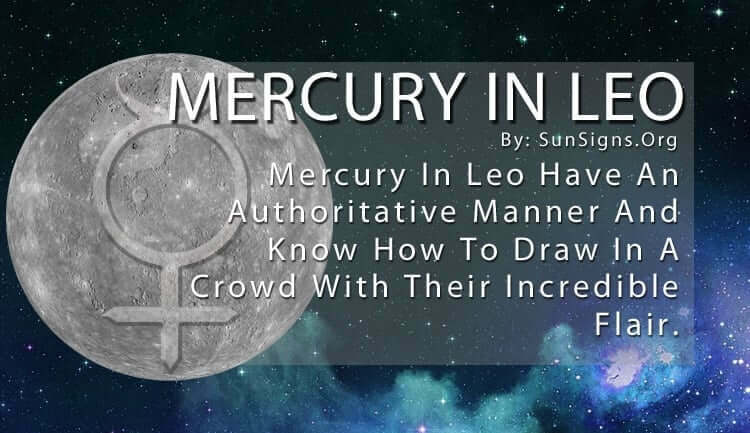 That’s why Mercury in Leo comes across in such an authoritative manner. They know how to draw in a crowd with their incredible flair. They speak with heart and enthusiasm. Those symbolized by the lion are natural born leaders. And you see it whenever they speak in front of a large group of colleagues or a smaller circle of friends. They love being the center of attention where they can show off their oratory skills. This is the reason that Mercury in Leo can speak with such passion and zest for life. Planet Mercury represents our learning, logical, communication and decision-making skills. With Leo, all of those things come from the heart. They are warm and caring and extremely generous with their time and effort. Many people recognize their giving nature immediately after talking to them. Their enthusiasm is infectious, as is the passion they insert into everything in their lives. Because Mercury in Leo speaks with such conviction, people listen attentively and get drawn into their world. They can present an overview of a situation that, while often low on details, is high on intellect and sophistication. If you’re looking for creativity and a unique perspective, Mercury in Leo is your go-to person. They are capable of convincing others to see things from a different point of view and getting these people to come to their side. Be sure not to criticize Mercury in Leo too much, because they take their thoughts and personal beliefs quite seriously. Their ego is one of the biggest in the zodiac, and they can be susceptible to negative reviews. Although they present themselves as strong and confident, underneath, they may be more show than reality. They can be fairly idealistic which sometimes clouds their view on something. It’s because of their ability to convince people that they can grow to be somewhat arrogant, which feeds into their inflated sense of right and wrong. This sometimes leads to bragging, which can cloud their judgment of a situation. But if they can learn from their mistakes, and it takes a strong Mercury in Leo to do that, they can come out mentally more stringent and more mature. And once they realize this, it will make them a more effective speaker. And that is something they will always strive toward. (Click here for more planets in signs). Mercury in Leo is all about style, which is evident in every aspect of their life. Because of this, they are best suited for any creative career or hobby. They adore getting to express themselves with glamor and theatrics and appreciate the same approach from others trying to make their point. They respond to those who put the same kind of effort into their communication as they do, because that is what they are most concerned with. This is how they get their point across the best. They put a lot of work into creating the perfect story or speech or conversation that helps to convince others of their opinion. It’s the warmth and grace of Leo Mercury person that allows them to be effective speakers, and their enthusiasm spreads through everyone listening. If they can hone in on that special something that makes them so efficient, they will go far in life. How To Summon A Dragon Familiar?